When Suzanna Brown landed in Matecaňa International Airport, Pereira, Colombia it was meant to be the start of a brand-new life in the country that she loved, with the man that she loved. Instead, she received the devastating news that her husband, Juan, had been killed in a motorcycle accident the day before her arrival. Suzanna packed up her entire life in Miami, Florida, cancelled her apartment lease, and sold or gave away many of her personal belongings in order to move to Pereira. Reeling from the shock of losing her husband and finding herself with no place to live, Suzanna was forced to find temporary lodgings and a source of income—but she was determined to stay in Pereira. She got a job teaching English online and over time she began to heal and appreciate the new life she was building for herself in Colombia. She now rents a studio apartment in the center of the city (el centro) for just under $200 a month. Supermarkets, shopping malls, restaurants, and nightlife are just a block or two away, and monthly utilities costs are water $11, electricity $25, and 10mb internet is $35. Suzanna’s biggest monthly expenditure is on food. She rarely cooks at home and admits that eating out is her guilty pleasure in life, which costs her $400 a month. Fortunately, Pereira has a great variety of cuisine and restaurants including local tipico cuisine at the low-cost end of the spectrum. The average low-cost meal can run anywhere from a couple dollars up to $5. For the more discerning palate, gourmet dining starts around $10 per plate. For entertainment, Suzanna enjoys visiting one of the many parks and plazas in el Centro, taking long walks, and eating out. 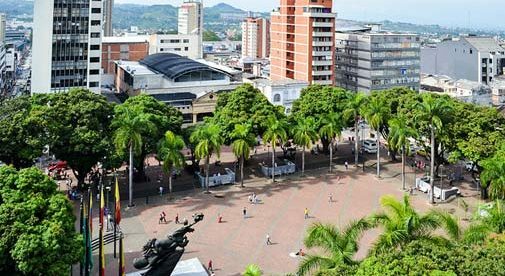 Indeed, Pereira offers a great variety of activities and places to visit such as monuments, scenic vistas, graffiti art locations, and even water parks. Pereira is a major crossroads in Colombia. A great deal of commercial, agricultural and inbound/outbound shipping passes through this city, which is a major hub. Suzanna’s Colombia story had a tragic beginning but healing and time has left her in a place where she is comfortable, and happy, and loves her new life overseas.